COMMENTS: This soap mold is beautiful and has intricate detail! Our CP soap releases beautifully! COMMENTS: I live in horse country. Not only do I love the horse mold, which has great details, but so do my customers. It’s great for any age , male or female. Durable mold. I’ve used it over and over. No signs of wear. Thank you! 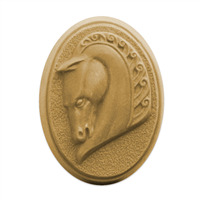 "Great Mold For Western Or Horses Lovers Soaps"
COMMENTS: Living in the southwest, this soap mold is one of my favorites as well as customers. Nice detail and very cool display. COMMENTS: This is a really good horse. COMMENTS: Beautiful horse mold! Love it for my soaps. COMMENTS: We have a lot of horse-lovers in our community. I'm excited to see how these soaps sell at my future events! COMMENTS: The size of the bar is excellent. The detail is very nice. My CP bars popped right out after freezing them first. 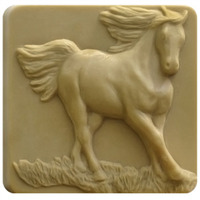 Even people who don't have horses really like this soap image. I posted a photo of a bar I made for myself, and I got an order for 25 bars. So, I ordered 5 more molds! A great investment! COMMENTS: Will be great for horse racing season! COMMENTS: I wasn't sure what to expect with this mold, the reviews was positive so I decided to try for myself. I really love them, I got really big bars, It was easy to unmold, and the horse just pops out 3D style and I am happy about that. Each bar sold out in less than 1 hour. "Great for horse lovers "
COMMENTS: We own several Tennessee Walking Horses and I was happy to find this mold. COMMENTS: Makes a LARGE bar of soap! I love the detail too. COMMENTS: This is a very pretty mold. Soap releases very easy. Soap came out perfect. "I do not usually use this type of mold but this is"
COMMENTS: Living in Texas I decided to try this one out for Christmas gifts. I usually prefer the silicone molds but what the heck. Much to my surprise the final product was picture perfect!